All you have to do is pay an entry fee of R50, a portion of which will be donated to Sable’s creatures. Upload your most pawsome photo ( ensure that the photo is high quality to avoid pixelation) and that’s it! There are 11 slots left so be sure to get your best entry in! 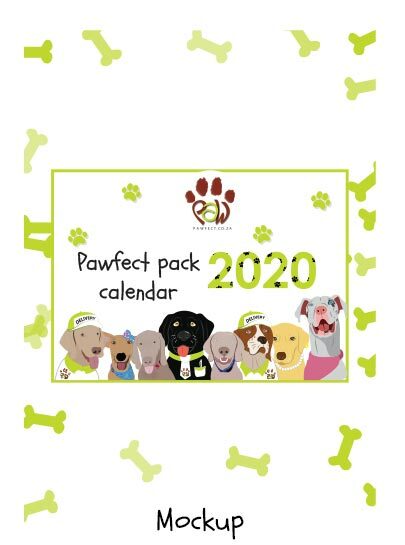 All entries get R50 off their calendar pawchase. Purchase this product now and earn 50 Pawbucks! Become furmous by entering our calendar competition. Stand a chance to be featured in our new 2020 Calendar! Part of your entry fee will be donated to Sables Creatures who does amazing work rescuing, rehoming. They are a safe haven for animals that have been abandoned, neglected, homeless and abused animals and work tirelessly. Their mission is to help animals in need and care and nurture them.